I have been ruminating for quite some time on how best to write about Elmo Del Rosario, but the words have, and still remain hard to ink. The fact that he is my father have made him too close for me to write with objectivity, and the distance between us, even more so. His passing on August 12, 2017 have forever stalled our relationship and it is now with great reluctance that I write this piece posthumously. What I know of my father have come in piecemeal, through deduction and assumption, parsing coloured opinions and rumours. The most treasured are from rare moments when we conversed about the day, shared stories and learned wisdom. At my father’s wake which lasted five days, I met a slew of his friends, colleagues and family I have never before met. 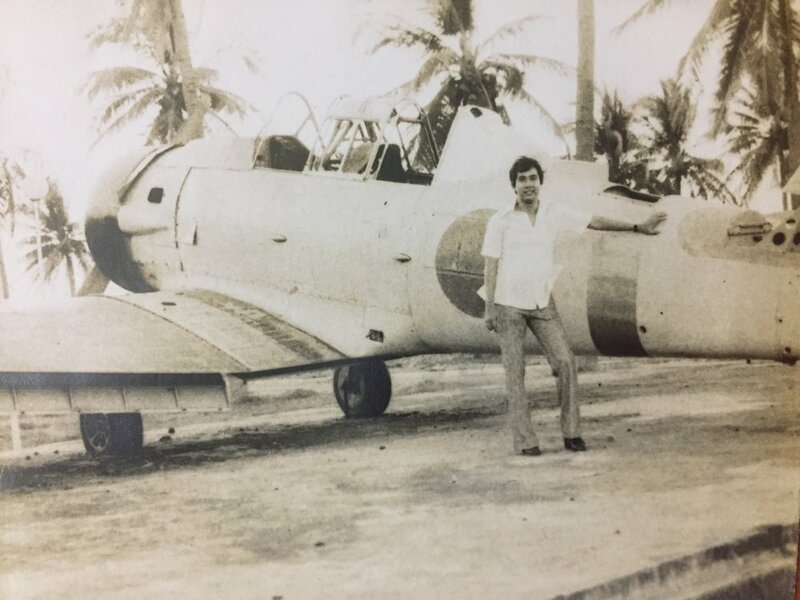 During the haze of grief and shock, I was regaled with stories and anecdotes about my father’s youth, his humour, and parts of his work life that remained abstract to me until then. What I know of my father have come in piecemeal, through deduction and assumption, parsing coloured opinions and rumours. From what I gleaned, even his closest friends only ever knew him in the context of their relationship. At the courthouse, he was the Judge. In his hometown, he was the elusive relative. Among drinking buddies, he was the happy go lucky jokester. No matter how close a person claimed they were with my father, they were not any closer to really knowing him. He was a mystery to most people. He held his cards close without exception, revealed only what was necessary and nothing more. He was undefinable in his simplicity. He was serious and easy going. He was just and unreasonably immovable. He was thrifty and careless with his spending. He was quiet with a roaring temper. He loved music without knowing what he was listening to. He was a devout Catholic but entertained witch doctors. He was unabashed in following only the rules of his own making. No matter how close a person claimed they were with my father, they were not any closer to really knowing him. My attempts to understand Elmo Del Rosario will continue without him. Hidden in the things he has left behind, are clues into his secret hopes and dreams, his pains and little joys and the unrequited life and love he yearned for. Between the rocks embedded in the walls of his house, threaded in the collars of the hundreds of shirts he collected, stuck in the pages of the dusty law books in his study, in the blood that runs from my heart to my feet, are all of him, to be collected and put back together, so I can finally ask him about it all. 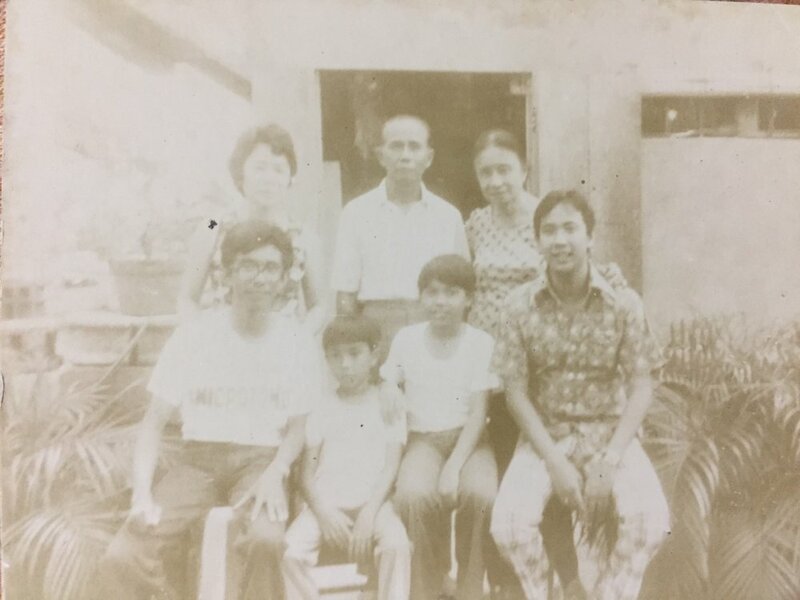 Elmo F. Del Rosario was born in Batan, Capiz (now Aklan) on June 23, 1947 to parents Patrocinio Salazar Del Rosario and Josefina Fulgencio Del Rosario. Elmo was second to the youngest of five boys. His father was strict and his mother was loving. 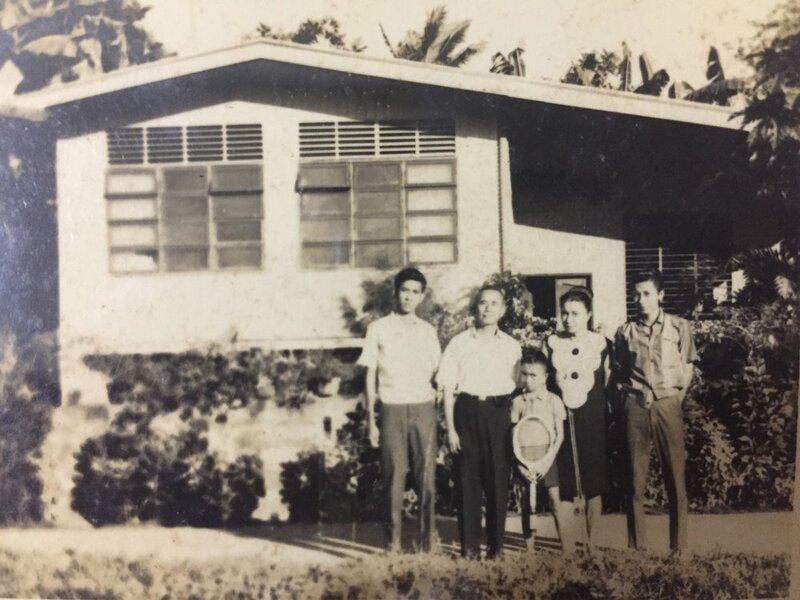 With his father, an Educator and his mother, a school teacher, his parents instilled in him early on the importance of learning. Elmo Del Rosario attended High School in Batan Academy and graduated from Silliman University with a Bachelor of Arts in Political Sciences and Economics. He finished his scholastics achievements at San Beda College as a Graduate of Law. Elmo Del Rosario was admitted to the Philippine bar in July 26, 1973. One time we saw Back to the Future, my first American film. He fell asleep and snored for the whole length of the movie. 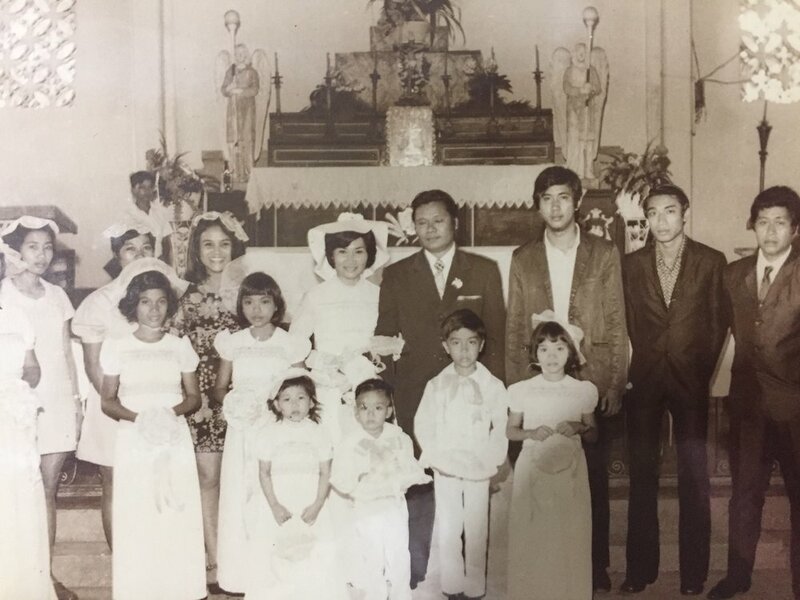 In 1972, he worked in Manila as a Legal Aide, then as a Research Attorney with the City Hall in Quezon City. 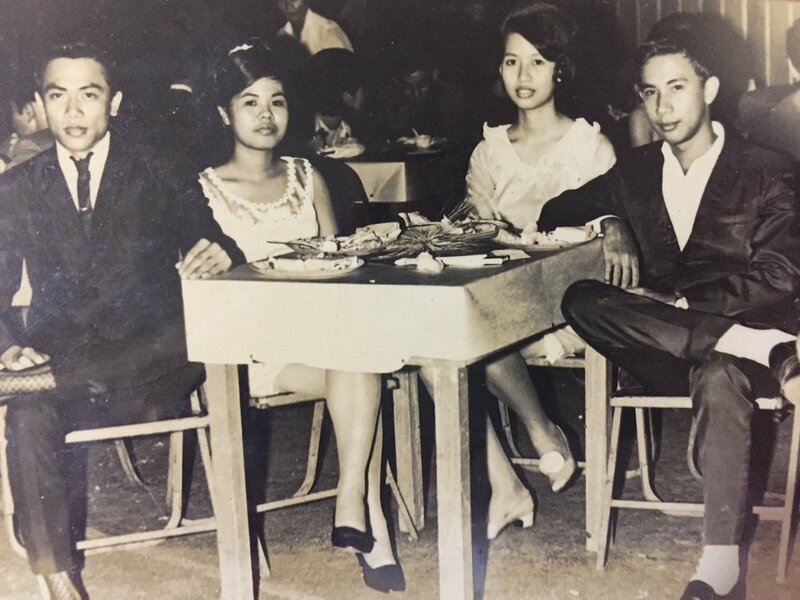 For three years my father was an NBI Agent in Dagupan City, followed by five years as an Assistant Legal Counsel with Luzon Stevedoring Corporation. My father held the position as Senior Legal Officer in Fort Bonifacio for one more year before moving on as a Law Faculty Member at Aklan College in Kalibo. He held this position while working as a 2nd Assistant Provincial Prosecutor for the National Prosecution Service with the Department of Justice. Sometime in the late 70’s, he met the woman to be my mother, while attending a Legal Workshop at PNOC, where she worked. They briefly dated and married out of wedlock. There was no fan fare, no wedding or reception, no engagement ring, no wedding rings. My mother and father married at the courthouse and only very recently did I learn, love also factored in the decision to wed. I have faded memories of life in different apartments in Manila. Later I understood this was during the time my parents were struggling to save their marriage. At some point, my mother and I moved back to her mom’s house and every now and then my father would pick me up on weekends. One time we saw Back to the Future, my first American film. He fell asleep and snored for the whole length of the movie. Despite all, my parents were unable to mend their relationship. My mom and I moved to Canada in 1988. My father and I started corresponding through letters. In my young mind, the letters did not foster a connection but an obligation to someone I no longer knew. I am not sure what his life was like then. It breaks my heart to imagine. He was always on the lookout for rocks even after a long day at work. He was known as Judge Bato or Judge Rock because he would often fill his briefcase with them. I saw him again when I was 16, eight years after we left the Philippines. He took me to the mall and we went shopping. At one point, he asked if I still played with barbies. It is hard to stuff eight years into a walk through the mall. We went back to the Philippines every 6-8 years after that first trip. My father was always quiet with a smoke in hand and I was always distant, filled with questions I could not ask. What I knew of my father was through my mother. It has taken a lifetime to understand the effects this had on me, my romantic relationships and ultimately my relationship with my father. On June 11, 2001, just short of his birthday, under the government of President Gloria Arroyo, Elmo F. Del Rosario was appointed as a Regional Court Judge of Kalibo, Aklan. On June 26, 2001, he took his Oath of Office. His focus and commitment to his career hampered some friendships and his lifestyle was greatly changed by the serious nature of his work. Fraternizing with friends in the same field must have been hard to navigate in the sobering atmosphere of the courtroom. His confidants were his legal team of 16 years while he was Judge at Branch 5 of the Kalibo Courthouse. Photos taken during day trips and outings with his employees and their family show an intimacy and familiarity, that gave me pangs of envy and longing. Photos of trips to Macau, Hong Kong and other parts of the Philippines surprised me since he never mentioned them. He looked happy which also surprised me. One photo was of my father in mid jump with a big smile on his face and arms raised in a triumphant V. I never knew this man. His Type 2 Diabetes started the long road of health complications. For over three years prior to death, he went for dialysis three times a week, while continuing with his duties as Judge. In between work and dialysis, he had undergone a triple bypass and unsuccessful eye surgeries that did not stop him from going legally blind. He did however, still texted with his silver Nokia. There were dizzying amounts of medicine and other confinements and complications that was revealed to me only after the fact. Records show he applied for Disability Retirement in 2015, but later amended the request. My father completed his duty on mandatory retirement on his 70th birthday on June 23, 2017. He retired without any pending cases. In the most distilled and direct way, we observed and studied the same minerals. Elmo F. Del Rosario is my father. He collected rocks and corals. During his lifetime, he must have collected hundreds that still remain in his house, where I now live. He was always on the lookout for rocks even after a long day at work. He was known as Judge Bato or Judge Rock because he would often fill his briefcase with them. I, also collect rocks. I would rub them under my thumb and inspect the speckles of colour of each find. I would pick up rocks that stood out against all the others and wipe the dirt from the surface to see its true potential. Rocks show history of the earth, they evolve slowly, imperceptibly. Rocks indicate linear time, shaped by the very same elements that affect us. They show clues about life and what came before. It was never through letters that we communicated, but through rocks. In the most distilled and direct way, we observed and studied the same minerals. We tried to listen to what the world was saying, about us, about time and love. One of his friends said to me that my father would still be alive today if only I came back earlier. But it was never about coming back at the right time. There is never the right time. I am here now and my father has passed because life and death does not stop for the right moments, and people don’t get to judge unless appointed. Elmo F. Del Rosario came to me a month after he passed. I woke up in the middle of the night from his voice so clear and happy, “Hi Kuh! Hello Kuh!” And I knew he is at peace.